The Hershey Bears beat the Springfield Thunderbirds 4-2 Wednesday night at the MassMutual Center in Springfield, Massachusetts. The win improves the Bears record to 24-20-0-3 (51 points) on the season, and gives them points in 10-straight games. The Bears are back in action Saturday night at Giant Center when they host the Charlotte Checkers. Puck drop is set for 7:00PM. Riley Barber would start the scoring and Liam O’Brien would notch a goal in the first ten minutes of the game to take a 2-0 lead into the first intermission. Steve Whitney and Garrett Pilon would add tallies in the second period for a 4-0 lead, but the Thunderbirds would finally find the back of the net in the waning moments of the period for a 4-1 Bears lead at the second intermission. The Thunderbirds would add a late power play goal for the 4-2 final. The Bears went with 11 forwards and seven defensemen. Lucas Johansen returned to the lineup. He has been out of the lineup since November 23rd (27 games). Christian Djoos was officially assigned to Hershey on February 3 for conditioning, and made his second start for the Bears. Scratches: Colby Williams (lower body), Kris Bindulis (upper body) and Joey Leach (upper body) were the injury scratches. Max Kammerer and Mason Mitchell were the healthy scratches. Nathan Walker served his one game suspension for his kneeing penalty in Sunday’s game against Belleville. Aaron Ness was called for slashing just 2:35 into the contest, but the Bears were able to kill the penalty. The Bears would get their first power play at the end of the Thunderbirds power play, but they were also unable to capitalize. The Bears would open the scoring with a goal from Riley Barber at 7:15 of the first frame. Liam O’Brien (14) and Lucas Johansen (9) were credited with the helpers. This was Barber’s 19th goal of the season. Liam O’Brien would make it 2-0 with another close-range tally at 9:40 of the first period. Mike Sgarbossa (20) was credited with the lone assist. The goal was O’Brien’s 14th of the season. The first period would conclude with the Bears leading 2-0. The Bears outshot the Thunderbirds 15-13 in the first period. The Bears were 0 for 2 and the Thunderbirds 0 for 1 on the power play in the first frame. The Bears would make it 3-0 with a goal from Steve Whitney at 12:16 of the second period. Beck Malenstyn picked the puck in the corner to find Whitney for the score. Malenstyn was credited with the lone assist (5). Garrett Pilon would gather a loose puck in the Thunderbirds zone and fire a short wrister for the Bears 4th goal at 16:28 of the second period, making it 4-0. The goal was unassisted. The Thunderbirds would finally get on the scoreboard with a tally from Jamie McGinn at 18:03 of the second period. The second period would expire with the Bears leading 4-1. The Thunderbirds outshot the Bears 16-9 for the second period. The Bears were 0 for 3 and the Thunderbird 0 for 2 on the power play after two periods of play. Connor Hobbs and Ryan Horvat dropped the mitts at 6:56 of the final frame. We have this one as a draw. The Thunderbirds would add a late power play goal for the 4-2 final. The Bears are 9-0-0-1 in last 10. The Bears are currently 4 points out of a playoff spot. Stars 1) Liam O’Brien, 2) Ilya Samsonovv and 3) Riley Barber. Springfield outshot the Bears 37-30. Ilya Samsonov stopped 35 of 37 shots for a .946 save percentage. Samsonov’s 35 saves is a new career high. Liam O’Brien and Beck Malenstyn led the Bears in shots with 4 each. The Bears have earned points in 10-straight games. The Bears were 0 for 4 and the Thunderbirds were 1 for 4 on the power play. 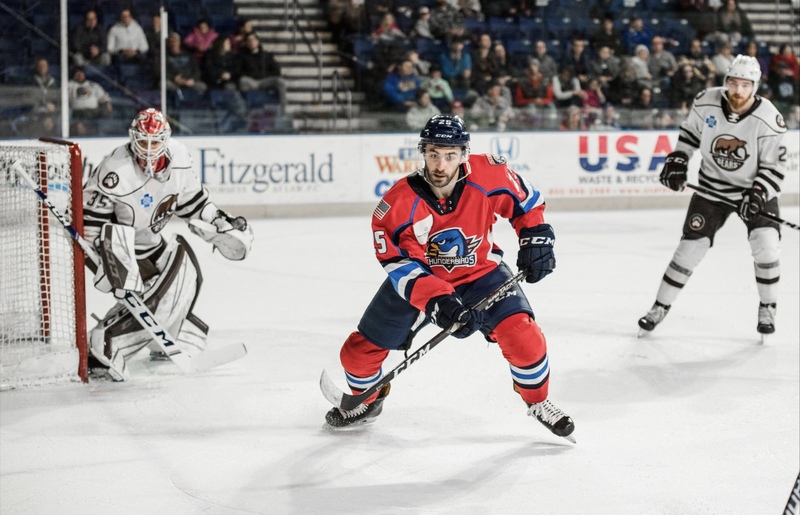 This entry was posted in News and tagged Garrett Pilon, Hershey Bears, Jon Sorensen, Liam O'Brien, Riley Barber, Springfield Thunderbirds, Steve Whitney. Bookmark the permalink.